Killer Characters: Meet Sheriff Sims. . .um. . .Ex-Sheriff, now ghost. . .
Meet Sheriff Sims. . .um. . .Ex-Sheriff, now ghost. . . I was the sheriff of my small town of Cottonwood, Kentucky for longer than I count. But that don’t matter now. What matters is that my granddaughter, Kendrick Lowry- Kenni Bug for short, was elected to sheriff in Cottonwood. You see, I’m dead. I died of a massive heart attack before she was elected, so I made it my ever-after mission to keep her safe. I’ve been busy! I’ve been scaring off any would be criminals for the past two years. It wasn’t until recently that I realized I couldn’t be in two places at once when someone killed Doc Walton and broke into White’s Jewelry. So when I showed up at Kenni Bug’s house in my ghost form, she didn’t take it so well. Needless to say, I ain’t leaving and since Deputy Lonnie Lemer retired, Kenni Bug needs a new deputy. Might as well be me. 1.How did you first meet your writer? Tonya was watching Longmire and she thought it would be cool to have a girl sheriff. Of course I knew it would be a lot more fun if she included me, so I tiptoes into Tonya’s head and the rest is history. 2.Want to dish about him/her? Awe, I like Tonya well enough. She’s got a lot going on in that head of hers so I have to push people out of the way to get my story told. 5. Did you have a hard time convincing your author to write any particular scenes for you? Nah. Tonya listens and if she doesn’t listen to me, then I can make sure she writes herself into a corner so if forces her to go back and fix it. 7. What are you most afraid of? I’m afraid my Kenni Bug is going to get her into a situation I can’t help her with. Her heart! There’s this young man, Finn Vincent, from the Kentucky State Reserve that has been sent in to help Kenni Bug and he is a big talker. I can see it in her eyes just like I saw it in her mama’s eyes before she married Kenni’s daddy. 9. Will you encourage your author to write a sequel? Will I? She is! She’s got a three book contract and it’s only getting better from here! 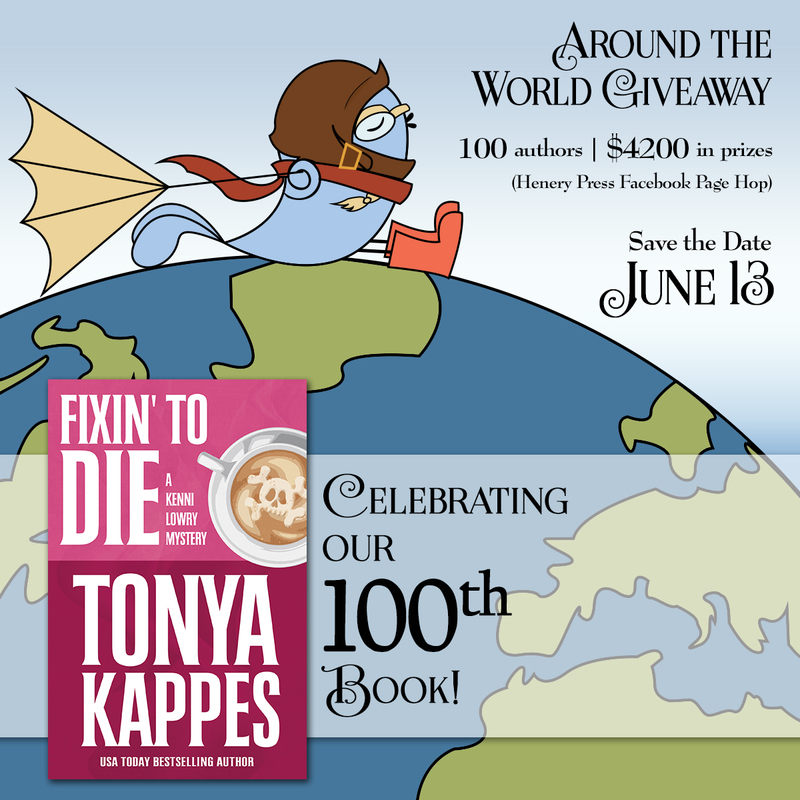 Fixin' to Die is Henery Press's 100th published book and they are celebrating big!! Be sure to head over to Facebook and play in the Around the World Giveaway with over $4000 in prizes! Congratulations to Tonya and Fixin' To Die!! I am so excited for this new series to come out, I've already pre-ordered. I can't wait to see the situations that Kenni Bug gets herself into. Hey girl!!! YAY!! So fun! I can't wait to see you at the Murder Mystery Weekend event! Love the interview!! Can't wait for book two & three!! SQUEEE!! I just turned in book two!! Love love love Tonya Kappes! Can't wait for new series! Love Tonya Lapped she is not only an exceptional writer but is also an exceptional friend. Love all of her works. Thanks girl!! You are doing so awesome in school!! I'm so proud of you! Oh Heather! Thank you so much! I'm so thankful for your kind words. What a great post. You always have new entertainment & adventure for us, Tonya! I am looking forward to reading this new series & more of your others, also. Thanks for all you do for your readers. Love Tonya Kappes & this new series sounds exciting! Can't wait to read it! I really enjoyed the point of view in this interview! So fun! And I can't wait to read the book! I like how you mix ghosts into your stories. Thanks Sandy! The paranormal adds so much more fun. I love ghosts mixed in with mysteries. Definitely need to add this book to my TBR list. Thanks for the fun interview. Thanks so much! They are so fun to write. I love Tonya Kappes series and I can't wait to read this new one! I loved this interview! Thanks Terri!! I'm so excited! I was a bit worried that with the Lavenes gone I wouldn't have a ghost public servant to look up to. I am so glad Sheriff Sims is filling that role. I have a feeling 3 books will not be enough! Oh. So sad. I've never read their books, but I do know they are going in my TBR. I hope I can fill that void. What a great interview, loved getting to know the sheriff better. I loved this book, it was fantastic. But that's no surprise, all of Tonya's books are. Great to meet you Sheriff Sims, definitely looking forward to reading more about you! He is a lot of fun to write! loved the interview! Tonya and her books are awesome! Thank you Nova!! I hope you had a wonderful vacation! Fun interview with the Sheriff. Your books are tremendously entertaining. I always look forward to seeing a new one from you. Glad you are part of this group. See you on the train in October ! Oh thank you! I hope they entertain! That's my goal. I love each of you! I am so excited about meeting these new characters and reading the series. I love Longmire and can't wait to meet the new (ghost) deputy in town. Tonya Kappes writes such fun books! Wasn't it so great when Longmire was picked up by Netflix? AWESOME right there! I can't wait to find this book on my reader tomorrow morning!!! Sounds so cool! Me too!! I preordered it too! Thanks so much, Arielle! I'm thrilled you are part of the KREW! You add so much! Looking forward to reading this book, and getting to know the folks of Cottonwood! Thanks Teresa!! I can't wait to hear what you think! Love Tonya Kappes!!! I've devoured all her books! Awe! Thank you!! I love you! Tonya writes such fun books! Just finished "A Ghostly Undertaking" and it was a hoot! Working my way through all of them! OH!! So glad you liked it! I just turned the six book into HarperCollins last week! I LOVE Tonya Kappes and can't wait to read this! I can't WAIT for this book to be released! I love reading anything by Tonya Kappes! Thank you Susan!!!! I'm beyond thrilled that you are excited. Love Tonya Kappes :). Can't wait for the book. Thanks so much! I can't wait to wake up....if I go to bed, and find it on my Kindle! I'm looking forward to this one!!!! Thank you so much! I can't wait to release it into the world. The sheriff and Tonya seemed to have hit it off real well. I'm mighty glad about that. Seems I've got this terrible preconceived notion about those Southern sheriffs. Oh my gosh! How cute is this interview with ghost sheriff and Tonya!?!? Love it! I can't wait to read this one! He sounds like a few people I know around my hometown. :-P Heck, he sounds like my grandfather...no *there* was a real character for you! Didn't take anything off of anybody, and would dig his heels in when he thought he was right (which was most of the time). The good side of that was that he couldn't be swayed by others' opinions, he made up his own mind. If this ghost sheriff were a real person and met my grandfather (while alive, of course), I think they'd have gotten along just like two peas in a pod. I love Tonya's books. Have read them all! And, can't wait to read this one. I have pre-ordered it!! Tonya is one of my all time favorite authors and I can't wait for the release tomorrow! Tonya Kappes is a wonderful author. I love her books! I love Tonya's stories and cannot wait for this series! Will be starting book 1 soon! Great interview, looking forward to reading. I love this preview! Actually, all of Tonya's books are wonderful. I am also excited about this page and signed up to receive it in my box. I'm looking forward to this book. So glad the Sheriff and Tonya seem to get along as a lengthy relationship (and numerous books) would be delightful. Just got my copy. Cannot wait to 'meet' the Sheriff. Kenni is my kind of girl. Congrats, that is quite an honor, to be featured as the 100th book!